Goa Gatherings to name a few… Teaming up in 2012 with long running bastions of the Psytrance scene ‘Phantasm Records’ to launch and manage Phantasm’s ’Organic Groove’ – a sub label with a dedicated focus on all aspects of Psychedelic Downtempo Music. Kicking things off with a series of Artist releases plus quality VA compilations including his own selections entitled ”The Prophecy” in 2012 (a Beatport No1) and ‘Ethnomusicology’ released in 2015. 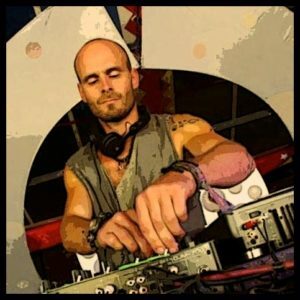 2017 looks to be another roller coaster ride with bookings confirmed for Noisily Festival (UK), Freedom Festival (Portugal), Terra Gathering (Portugal), Boogie Woogie (UK), Harmonic (France), Chrysalid (UK), Triplicity (UK) and his latest venture into the sunny climates of Portugal where he co-hosts his own Festival called ‘Terra Gathering’. A vibrant melting pot of creatives, forward thinkers, friends, lovers, sisters and brothers.. powered by the intention of change, the mystery of spirit, the love of music.. and the ancestral rhythms of time.